Clickity-click, tap-tap-tap—so the soundtrack goes for many office environments. But have you ever wondered how many mouse clicks and keypresses you make every day? Did you ever pause to think about how many miles your mouse cursor moves across the screen every week? If you're curious about these numbers, look to free utility Mousotron for the answers. Mousotron's compact dashboard shows 14 usage metrics by default. Mousotron looks like an old-fashioned digital dashboard, with counters for mouse movement distance, keystrokes, and mouse clicks. It has separate counters for left, right, and middle clicks, as well as for double clicks and mousewheel rotations. It even measures the speed in which your mouse is moving, and can display the numbers in Metric or Imperial units. You can submit your Mousotron results to an online scoreboard, to see how you did compared to other users. In this regard, Mousotron is similar to free application WhatPulse, which even lets users join teams and pit their collective typing stats against other teams. 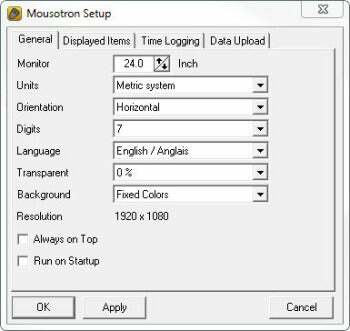 Tracking cursor distance is tricky: Mousotron needs to take into account both your screen resolution and its physical size. It automatically detects the resolution, but you must manually feed in the monitor size in inches. I set the correct monitor size and verified Mousotron's accuracy by holding up a ruler against the screen while moving my mouse. This is not very scientific, but it did show Mousotron's measurements are not far off the mark. To double-check, you can also verify them against MouseTracer Free, another program that tracks mouse distances. Mousotron lets you configure the measurement units used, the dashboard orientation, and many other parameters. In its default configuration, the Mousotron dashboard shows 14 data fields. This can get distracting, especially when you see the keystroke counter tick up as you're writing your umpteenth email for the day. Fortunately, Mousotron lets you toggle the items displayed so you can reduce the amount of data shown. You can also minimize the dashboard to the system tray and have Mousotron keep adding up the stats in the background. Mousotron also has a reporting feature, but failed with an error message when I tried to produce a report, due to file permission issues. When you're done for the day, you can pull up the dashboard and see how much physical movement accompanied your work. If the number is impressive enough, you can submit it to the scoreboard. Mousotron may not revolutionize your workflow or transform your productivity, but it can be fun to use, especially if you type a lot. Track your typing and mousing distance and compare them with other Mousotron users.